I returned to Singapore on work for three days. The days at work is somewhat OK … not gruelling as I originally anticipated. At the end of the second day of work, Patrick invited the project team out for dinner. 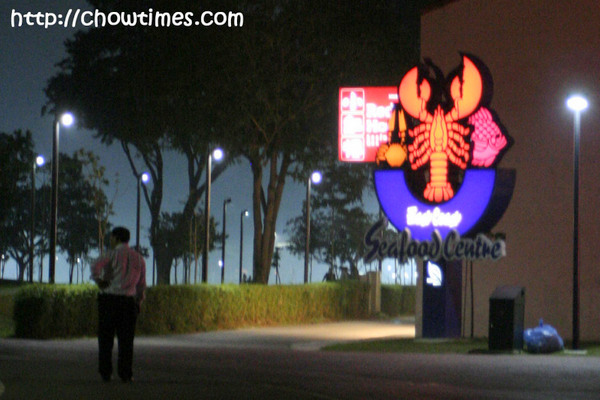 We went to the East Coast Seafood Centre where there were a lot of major seafood restaurants concentrated in the block. 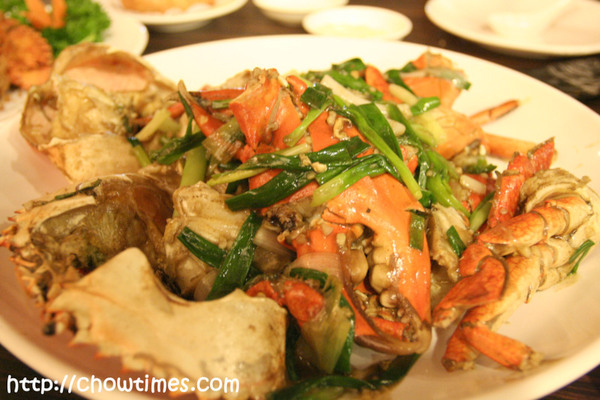 Crabs, in particular chilli crab, is very popular in Singapore. 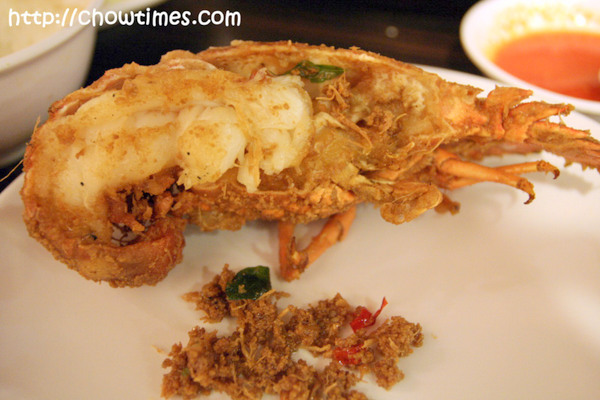 Many people consider the chilli crab the defacto national dish of Singapore. So, the East Coast Seafood Centre is undoubtedly the place to bring guests and visitors to. Even on a weekday night, the parking lot was quite busy. I was told that the traffic and parking is worse on weekends. 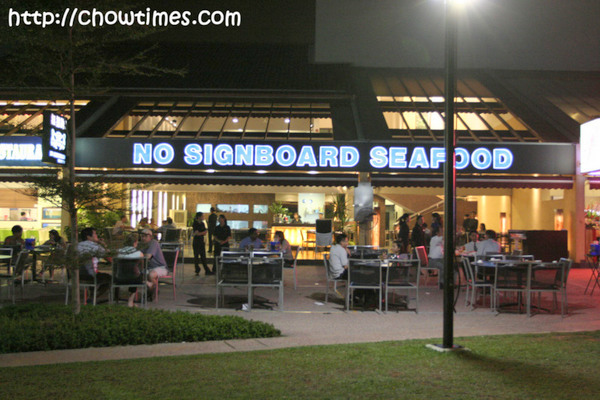 We went to this restaurant which had an unique name: “No Signboard Seafood”. 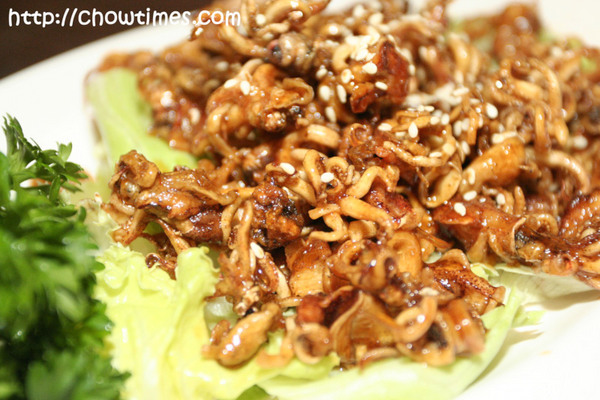 We started off with a plate of Fried Crispy Baby Squid. I had never tried this before. They were very good — very crispy. A great starter dish. I told Patrick I wanted to try their chilli crab and left all the ordering to him. However, when the crab came it was not chilli crab! Grrr … instead what he had ordered was the White Pepper Crab (or I think that’s what Patrick said it’s called). It wasn’t bad at all, in fact, it was quite good. It’s just that it’s disappointing that we did not have the chilli crab. The chilli crab gravy would have been great with hard-crusted bread or rice. This one does not have gravy. The crab was fresh and very fleshy. It was good but wished it was chilli crab … just can’t get over missing chilli crab!! This is something new too to me — Crayfish (or crawfish). I think they were fried with butter, I am not sure. The crayfish looked like a cross between a lobster and a very, very large prawn. The flesh tasted a lot like lobster. What I liked best was the flakes from the fried butter. Great on rice. 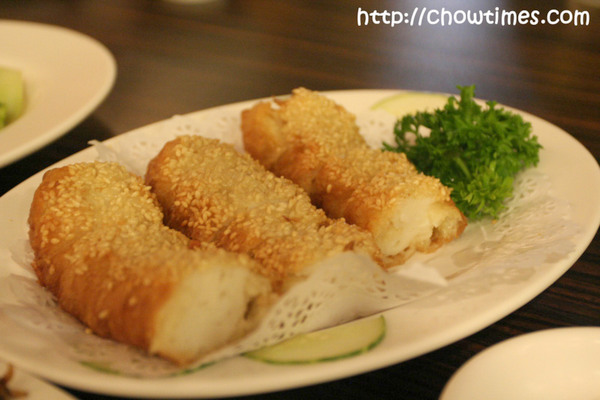 The below is a squid dish wrapped by yutiao. This is unique but does not have much of a taste. 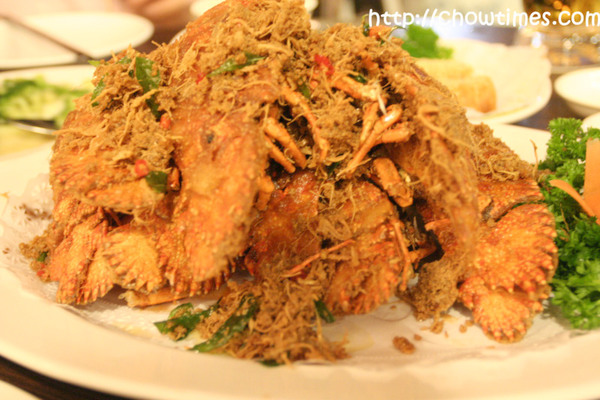 I love Chilli crab, black pepper crab, golden fragrant (kumhiong – with curry leaves) crab and lately, also salted egg yolk crab. 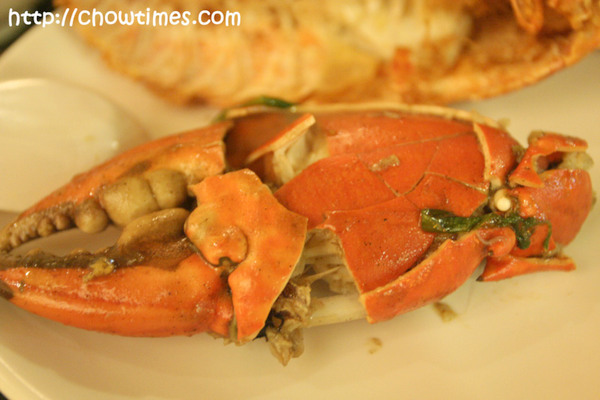 There are many crab dishes in Singapore and lots of good places to have them. Your crayfish was probably fried with butter and crispy oats. It was en vogue in Singapore in the last 2 decades to eat oat prawns etc. Another good seafood restauant is Red House. Also Jumbo. Maybe you’ll get a chance to try them on your next visit to Singapore. Hi Daisy: I have no idea, sorry. I was only in Singapore for a few days work last year. I see a lot of seafood restaurants in the East Coast Seafood Center and would think that there’s where the top crab joints are. i came across ur site, and i would like to know, where can i have the best black pepper crab in singapore? oh, i’m so sorry crawfish is a new thing for you! it is soooo good! people in the southern us enjoy it on a daily basis. i love it!! next time you are in the southern united states you MUST try crawfish etoufee. For introduction, i’m from Indonesia. I can supply Lobster/Crayfish/Crawfish/Crawdad for Restaurants, Hotels, Breeder, of personal. Hi MD Jin: I believe crayfish and crawfish are the same thing. They are also sometimes called crawdad. I found the following words showing you have crayfish. Is’t true? I like crawfish meat very much. Please let me know about your crawfish. Like I said, Singapore is known for a few great dishes and Chili Crab is one of them. I always make it a point to taste the specialty of the city/country I’m in. Whether it be Pizza in Naples, Italy or Peking Duck in Beijing. CP: That would be exciting for me if I could catch crayfish in a BUCKET! I had never had crayfish before and did enjoy it a lot. Sorry, I don’t know where Long Beach was located but it is quite famous for seafood, especially Chili Crab. Did you finally get to eat Chili Crab while you were there? That would have been the first dish I would have asked for. God, I miss Taiwan. Those crayfish look great. I remember catching them as a child and bringing them home to my grandmother in a bucket. Mmm..
Drunken Prawns sound so yummy. I heard about the famous Long Beach — where is that? On East Coast Seafood Centre too? Here are some places that we have blogged about https://chowtimes.com/dining_out/malaysian/. Other great places for Malaysian food are (1) Ellie in RIchmond (2) Tropika, (3) Hawkers in Main and (4) Kedah House on SE Marine Drive. One of my best memories of Singapore was the Drunken Prawns and Chili Crab at a place called Long Beach. Here in Seattle we have a nice place to eat Chili Crab called Malay Satay Hut. The Chili Crab sauce was quite nice albeit a little on the sweet side. They serve very good Malaysian food. My kids love the satays and roti canai. We like their belancan and beef rendang over chicken-flavored rice. Any good places in Vancouver for Malaysian/Singaporean food?